Acknowledged author Hall H Pearson Education wrote MyMathLab: Student Access Kit comprising pages back in 2003. Textbook and etextbook are published under ISBN 032119991X and 9780321199911. Since then MyMathLab: Student Access Kit textbook received total rating of 4.5 stars and was available to sell back to BooksRun online for the top buyback price of $43.12 or rent at the marketplace. 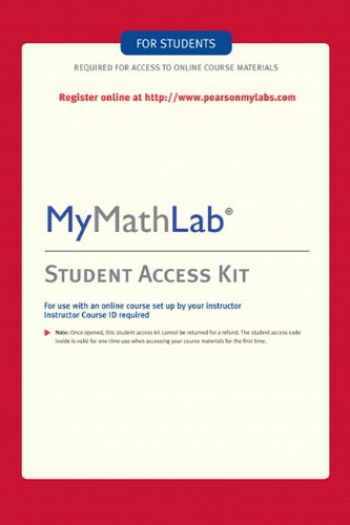 This access kit will provide you with a code to get into MyMathLab, a personalized interactive learning environment, where you can learn mathematics and statistics at your own pace and measure your progress. In order to use MyMathLab, you will need a CourseID provided by your instructor; MyMathLab is not a self-study product and does require you to be in an instructor-led course. This product is for the national MyMathLab access kit. If your school has a custom MyMathLab course the printed access card will not work. MyMathLab includes: Interactive tutorial exercises: MyMathLab's homework and practice exercises are correlated to the exercises in the relevant textbook, and they regenerate algorithmically to give you unlimited opportunity for practice and mastery. Most exercises are free-response and provide an intuitive math symbol palette for entering math notation. Exercises include guided solutions, sample problems, and learning aids for extra help at point-of-use, and they offer helpful feedback when students enter incorrect answers. eBook with multimedia learning aids: MyMathLab courses include a full eBook with a variety of multimedia resources available directly from selected examples and exercises on the page. You can link out to learning aids such as video clips and animations to improve their understanding of key concepts. Study plan for self-paced learning: MyMathLab's study plan helps you monitor your own progress, letting you see at a glance exactly which topics you need to practice. MyMathLab generates a personalized study plan for you based on your test results, and the study plan links directly to interactive, tutorial exercises for topics you haven't yet mastered. You can regenerate these exercises with new values for unlimited practice, and the exercises include guided solutions and multimedia learning aids to give students the extra help they need. NOTE: Access codes can only be used one time. If you purchased a used book that claimed that it included an access code, your code may already have been used and it will not work again. In this case, you must purchase a new access code. For Customer Technical Support go to http://247pearsoned.custhelp.com Phone Support 800-677-6337 Please note the packaging on this product has changed, whether you receive the current cover or earlier cover the product is still the same.